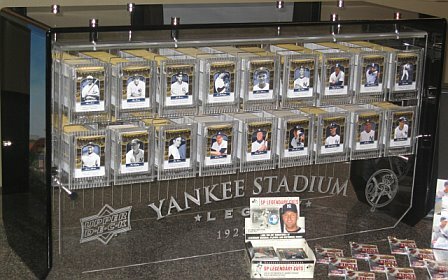 One of our readers, Greg, e-mailed me that he had a bunch of Yankee Stadium Legacy cards for trade. After I did a short jig, I e-mailed him back with some banter and cards to try and seal the deal. We worked it all out and he sent me a whole mess of cards including some Pujols, and a couple for Sooz. These are the YSL cards I got, I copied and pasted this list from the e-mail so hopefully this is what was there, lol. I now have 808/6661. I can't wait to see how long this actually ends up taking me. The other thing I wanted to mention to everyone that has e-mailed me for cards in the past, and will in the future is THANK YOU!! I enjoy talking to new people about cards, and I like trading. Trading saves everyone some money, and we all get what we want. I invite you to e-mail me and let me know if you have anything I might be interested in because I have plenty of cards that I have no interest in to trade. And another thank you to everyone who stops by and reads the blog. We have written quite a few this month and are hoping to keep it going into February. That YSL storage unit is totally awesome. Congrats on getting to 808. The other day, I entered all of my YSL cards into the "Own The Legacy" site. It turns out that I have 158 of them (including 70 of Don Mattingly, so I'm #193 in the standings. Interesting that you are #193, I wonder what I would be if I entered my cards there. I think someone just said I am sitting at #30, and I had no idea what they meant so maybe that was it, lol. Great blog I look forward to reading it. It's pretty cool being able digitally store and search through a list of the cards you have. I just wish Upper Deck made it easy to export the list to some sort of Excel format instead of having to go through the whole list. Even a quick lookup where you type in a number and it says "have" or "don't have." I was logging mine in an Access database when the site went down a few times but it's hard to keep up with all of those cards as they come in.